It’s 02h00 in the morning on Benguerra Island, and I am trying to sleep again. But I just can’t. Every time I close my eyes, imagery from the previous day’s fishing out off Benguerra Island in Mozambique, comes smashing through my mind, in 4K Technicolour. Screaming reels, crocodile couta, gas bottle yellowfin, bus sharks, acres of bait and baitballs so intense that the fish were pushing themselves out of and onto the top of the foaming ocean. And you know what that means – marlin! But, let’s rewind and try play the day out in words…luckily we got some great pics and some video that we will also explain with. Diogo Martinez. My latest victim. This guy has lost it. Completely. He even stopped partying as hard as his reputation. 6am, I’m collected. We’re both in perfect shape. Unbelievably for a Sunday morning in Vilanchaos. Bahia Mar is where all the cool kids work and our rendezvous with our brand new ride. Reflection. Owned and operated by Hooper and Louw, she comes with a pro skipper, Simon, and pro guide, Dean Taylor. Who came with a girlfriend, Mazerine, who has also already lost it to the fishing fairies. We collected another fishing crazy girl Lwana, from Bahia Mar, and carried our coolers and equipment down to the surreal beach out front. Dhows and Sportfishers anchored up and down. The three of us chatted and enjoyed a thoroughly peaceful moment as the good ship Reflection, came in to get us. Soon we were at Benguerra, where we collected Keegan, of Cape Town. There was a lively congregation gathered on the beach at Marlin where we got Keegan, on the inshore lee of Benguerra, and pro guide Dean sprang into action! Halfbeaks! And then the breakthrough idea of the day…Lula! Huge. They are called East African Squid. Or Potter’s Squid. And this one weighed in at four pounds! Since my mate in Jeffery’s Bay, Marc White, chatted with me about swimming a big squid bait down deep with a Mydo, I been very eager to swim a huge squid around here. I also have been under the heavy influence of my colleague Dr. Mario Lebrato, who says that in Europe he fishes with Lula all the time. For blue fin tuna! We bought the squid! A few actually. And some of the biggest halfbeaks ever seen. Plus a few small ones too. Halfbeaks are the best and most hardy bait of them all. And then…Margaruque became a reality, by about 7am. But someone told the fish there that we were coming and they were totally in hiding. But that’s Margaruque. And after a solid two hours of serious casting, we gave up, with the wind luckily. The pumping South South West had backed off and we were looking at melted plastic. But the swell was way up and the washing machine from back of Margaruque to the blue is about 10 clicks! Of bashing and bouncing. But it’s so worth it! We got through the surf easily enough that Dean started tying the biggest squid together with wax thread. He tied the head to the body. And then stitched in a huge circle up top. Then he cunningly inserted a stinger single for wahoo. And buried it’s tip in the head so a marlin wouldn’t feel it. It’s just a 8/0 single wire hook that would rust away if left behind. Tied on with seven strand. One many named lure (Rapala since I was born, Halco later, and now every man and his dog makes them). One halfbeak on a Mydo. One on a pink Hawaiin eye (I am 48 and thats what they were called back when I started!) And the huge squid. No gaff. But I don’t mind fishing without a gaff, I find the fish really win, and I’m actually on their side these days. Nothing comes along. The huge squid is skipping and slapping the water audibly from the boat. Well those brand new Suzuki 140s on Reflection, are literally silent. The huge half beak is sliding along solid. The Mydo and other thing with many brand names are down and away. Still no fish. It’s mid-day. Mozambleak. Birds and bait. Baitballs. Action. The whales start performing. And we get close…and closer, until, spoons and dropshots away! But the still green crew weren’t getting their range and targets right. And then it began. The lure with many names on a TLD 25 spooled with 30lb that literally melted off the reel to the most delightful sound. After such a long morning of nothingness. I grabbed the nearest victim and she bucketed up and took over. “Put some drag, more drag!”, consented Dean, as I pushed to sunset. The lines cleared and the fight was well on. Lwana is well versed in big game fishing and she had control soon enough. Lwana has already battled a marlin! Assisted by some great driving by Simon, I thought she may have had a a chance. But what I never thought about, cost us the fish. It must have been a 30kg class animal and it had so much line out still. That, when we fought the fish with the boat, we got ourselves on one side of the 30m ledge, and the fish on the other deeper side. I saw the rod twitch and flick, I grabbed it from Lwana and started cranking. I felt the line hit the ledge again. And pop, it was gone. That’s 0 for 1 on big gamefish. And one no name R200 lure gone. Then the next one went, a far more controlled fish this time. Skipper Simon and I, actually saw the shoal of wahoo come smashing into our wake, we were screaming. I am used to fishing without a gaff. I actually like it. I crossed the floor a long times ago. It’s risky business having no gaff. But I really release literally every fish I catch. And often, they are what I call forced releases…when the hook shakes right next to the boat. This is actually ideal scenario for me – except for getting a nice photo and measurements. But we don’t even touch the fish. It gets away scott free! And this is exactly what happened to our second wahoo. It was green as hell and Dean hung over as far as his lanky frame could and grabbed the fish by the tail. It went mad. Shaking it’s head furiously, splashing everyone. Then the hook fell out. And the fish did a cartwheel type maneuver right out of Dean’s hands. It just twisted itself free! 0 for 2 on big gamefish. By now people were kind of avoiding each other on the boat. But we had found the fish, and we were on a ledge, and so the jigging sticks came out. The first victim was Keegan. All dressed up with a 30lb braid weapon and lots of innocent intent. BANG! But it let go! And so I started. It wasn’t five when the THING hit! And absolutely annihilated me. The first 15 seconds I had the edge of surprise, and instinctively hit the throttle. But I got pulled back down, so hard, it could have only been Ambo, GT or Garupa! The fish reefed me in less than a thrifty thirty seconds! Mydo trace gone! 0 for 5 was another on off on the jigging, only lasted a few seconds. Now Dean knows his game, and he has the drag on his huge 8000 coffee grinder as tight as it can go. It’s to stop GT’s going into the reef and cutting you off as they do. The drag is so tight that I could not pull any of the 130lb braid at all. Dean calls it GT drag. And he had it on this setting, when all hell broke loose. I was in one back corner. Diogo in the other. Dean in the middle. Dean had the simbiri pole and 8000 with 130lb braid tied to a plastic and he was cranking it up off the bottom at hyper speed. Keegan was watching eagerly from the front and noticed a hyper huge fish come under the boat at the same hyper speed. It was going for the dropshot. And it connected with Dean, very, very hard. Right under the motors. The couta hit that lure and Dean buckled. 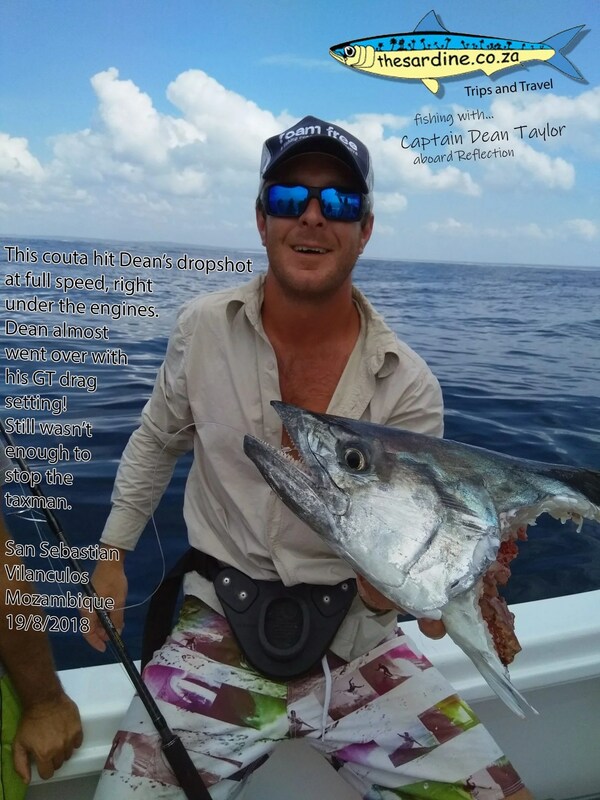 The impact was so severe it pulled Dean a metre, almost right out of the always open tuna door between the motors. He had jammed himself between the sides for grip by the time I got to him. The fish never had a chance to turn away and run, it was trapped by the amazingly powerful drag and short line, to Dean. It just went around in hyper high speed short circles under the boat. Dean grappled over and around the starboard motor and was hanging over the gunwhale with the rod tip pointed right into the water going round and round in circles. I was hanging onto Dean. Keegan was hanging on to me. Dean eventually got the drag off a turn. And the huge fish finally it got it’s head away and tore off towards Linene. At blistering speed. Only Keegan saw the fish so I was convinced at a huge GT. So much violent and raw power. Dean was just hanging on for life. But he also said Serra (Couta). Then the fish stopped. The sharks got it. And we got the head back from a fish that might have gone 35kgs. Or 25. We will never know. We were all stunned, even I went quiet, after all that. But the birds came back, the fish surfaced, and I threw my Luck Shot into the fray. Bang, I got one. I gave it to Lwana to bring home, and soon I had my favourite livebait. A jube jube bonito. I had made a two treble trace just for this eventuality, earlier on during the morning. It fitted perfect, and I dropped my beautiful little bonito over the side. It wasn’t one minute and I got smoked. Whoohoo! This is my game and soon I had an angry couta, another really big one, at boat side. Dean went into fish tailing mode, and luckily the cameras were rolling. On the first pass, Dean couldn’t a decent grip around the fishes real thick tail. And the second and now the fish was getting angry. Only one of the trebles was holding. The other was flailing about a foot up the line. So dangerous. So Dean couldn’t go for the gills. I brought the fish around again, and Dean grabbed hold. The fish was really big, and as usual when tailing a fish, the hook came free. I knew straight away what would happen next. The fish got it’s head back into the water, found purchase, and literally blasted off out of Deans hands. It’s impossible to hold a fish that size like that. I really like fishing without a gaff! The fish escaped in perfect shape and health! Stoked! 0 for 7? Livebaits don’t count! I realised now that we had better get a fish for the hatch. To at least remove the theatrical mombakkies we were still wearing (South African for No Fish masks). I set lines in a more tuna like pattern, and we moved off to find the bigger yellowfin. And man did we find a big one. Diogo got on the rod. It was a double up strike. Diogo was doing real well. Keegan on the other rod too. But Keegans fish was acting strange, and so was Diogo’s. They were coming to easy, because when I saw Diogos fish, it was huge! Well for this place anyway. It looked 30kgs. Then the sharks hit. They smoked Keegan and soon he was watching line melt off his TLD. I went into panic mode and grabbed Diogos line. I almost got to the leader when the line snapped. But, above me. Diogo had been pulling against me so hard he snapped the 30lb. But I still had the fish on, and was winning as the sharks circled below. Then Simon ran over to help and grabbed the leader, pulled too hard, and the hooks came out?! Nobody could believe it. And everyone was facing outwards on the boat, or looking down. Now I really felt the need for a fish. The yellowfin came up, I got in a real good cast, cranked the handle twice and bang. It was a small guy, maybe 5kgs, and Keegan thoroughly enjoyed the tough little fish. His first ever. And Dean grabbed it’s tail so hard he left fingerprints as he triumphantly hauled our only fish over the gunwhale. The boat erupted with life. It was far from over as we got our groove on and forced released and released a bunch more fish. The sharks were living off our live baits though, so we were mainly jigging and sight casting. We got a another lovely yellowfin, about 10kgs or more. And were drifting merrily down the ledge. The huge squid bait from before was still intact and lolling around having fun behind the boat. A ratchet made a noise and we all looked around confused. The TLD 2 speed has a normal sounding ratchet, not like those gold reels who gurgle and gargle. It was the big stick. I sprang up and got the rod from the rocket launchers. But, I was too late as it turned out. By the time I had gotten the 2kgs of drag off – the fish had started jumping already. It had found the stinger buried in the head for wahoo. And was not going to swallow the whole lula now, so that circle hook could do it’s work. The day never even ended then. The fishing still continued for hours, but after the marlin, my memory kind of just faded away! It all became a blur of ratchets, flying spoons and jigs, and fish on. Double and triple strike action. Until 02h00 on Monday morning! When it all came flooding back at me. Benguerra Island is a very hard place to sleep! If you want to fish with us like this, there are very many options you can choose from – on The Sardine News. From USD to Rands and even Mets, we can get you out into these wildest waters imaginable. We have our operations, and partner operations who have been working with us for many years, even decades. We operate anywhere we have to in Africa. Get in touch on umzimkulu@gmail.com to chat fishing.